The challenge this week at CAS-ual Fridays is to use 3 colours: aqua, green & orange. Not my usual sort of colour combination but I decided to play along. My camera was playing up so the pictures aren’t too good. 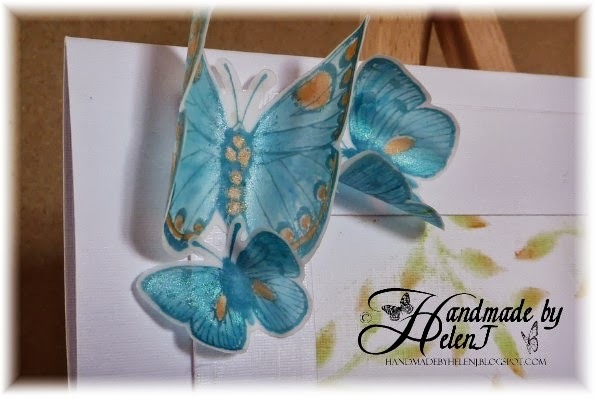 However, it’s still possible to see that the butterflies were stamped in teal ink on vellum then coloured with Cosmic Shimmer watercolours in aqua & orange. The leaves were chalked through an Imagination Crafts mask. 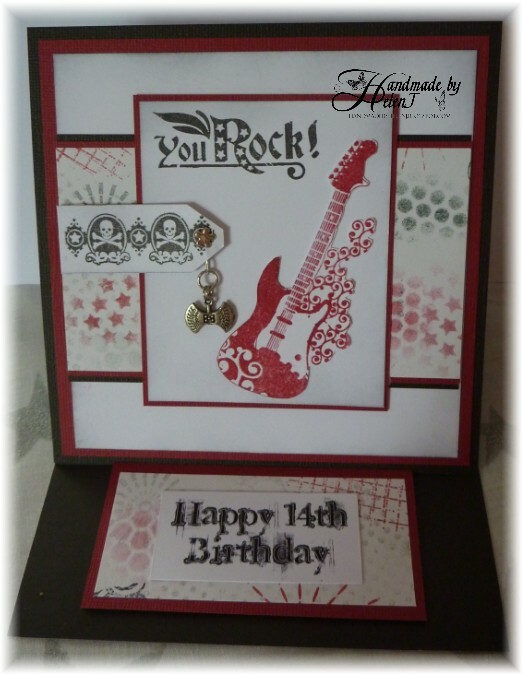 My son turned 14 the other day (where on earth has that time gone?!) 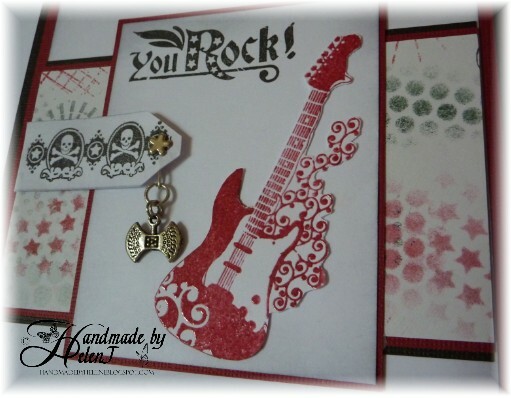 As he’s a very keen guitarist & loves rock music, Inkadinkado’s Rockstar stamp set is perfect and was bought with him in mind. 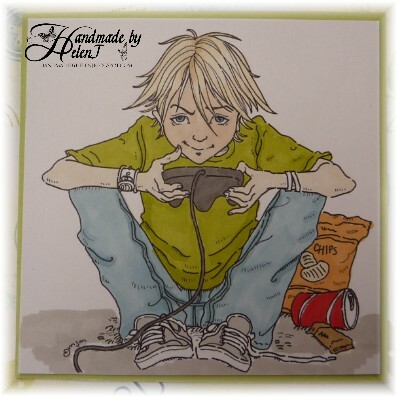 But when I came to make the card I was short of inspiration until I saw this card which was based on a sketch. 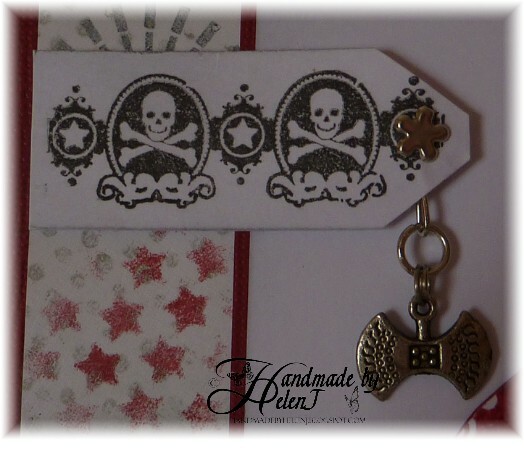 The backing paper was made with a combination of inks & various masks and stamps. The main image was stamped in Brilliance Pearlescent Poppy then clear embossed. 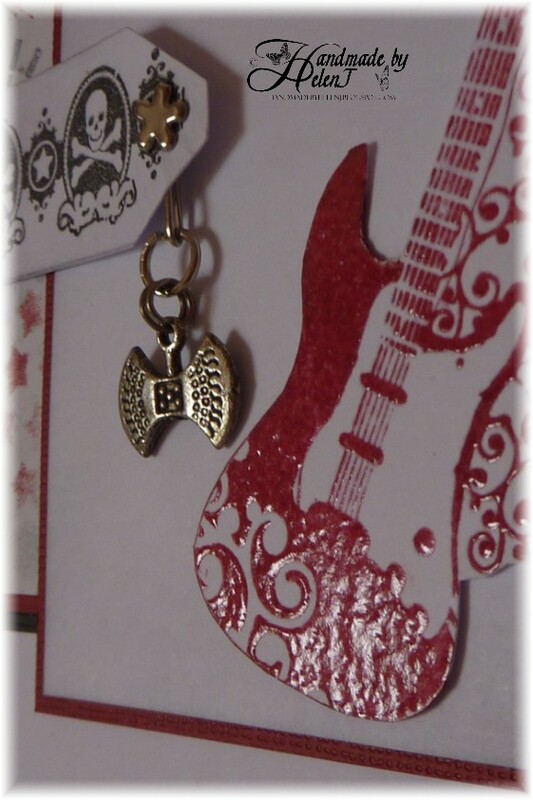 Charms wouldn’t normally be appropriate for a teenage boy but this one came from a set by Crafty Bitz which has a few good ones for rock music-themed cards. For once, I made a card which turned out just the way I intended. Well, almost! 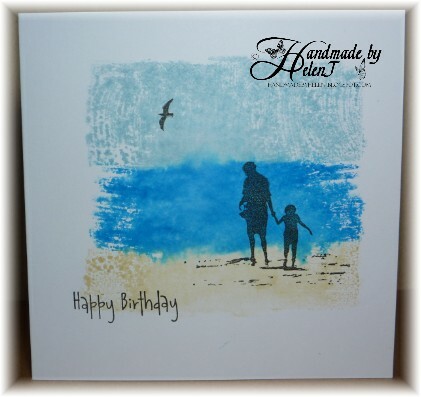 The inspiration for this card came from the front cover of a book I saw whilst browsing round a book shop. It was created by drawing a dress template on tracing paper & cutting it out to make a mask. 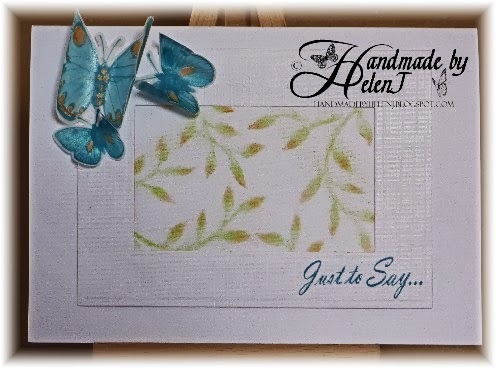 I originally intended to stamp through the mask using a background stamp but then hit on the idea of using Little Claire’s Butterfly Tree stamp instead, coloured with Cosmic Shimmer watercolour paints. I need a new paintbrush so the painting doesn’t stand very close scrutiny but luckily I think the overall effect works! The dark paint looked purple in the pot but by a stroke of luck I had some ribbon which perfectly matched the dark blue it turned out to be. 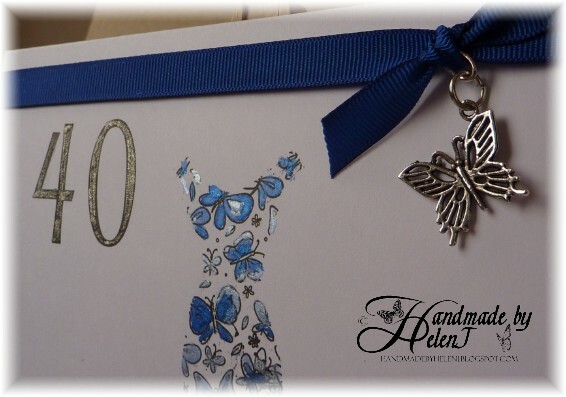 I coloured over the numbers with a Sakura Stardust black pen to add a bit more sparkle & added a butterfly charm to finish. 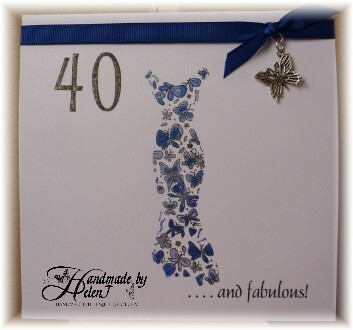 Card makers often dread having to make cards for the male of the species. Add into the mix that the male concerned is a teenager and it’s doubly difficult. Mo Manning has some great digis which make this task a whole lot easier and when I saw this one of a boy intent on his games I knew exactly who it would be perfect for. 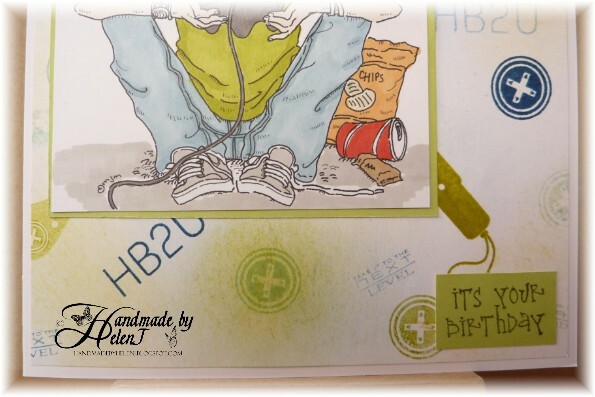 The main part of the image was coloured with denim & pear green Promarkers, the green chosen because it matches Lettuce Adirondack ink – one of the few Adirondacks I’ve got, and which I was using to make my own backing paper. 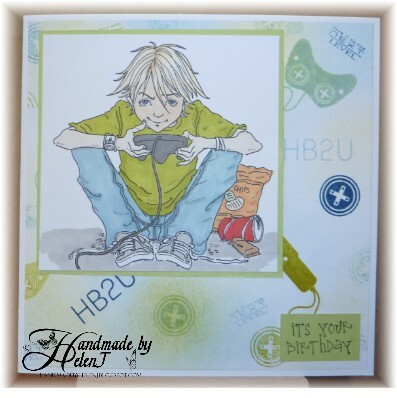 The backing paper was made by using my Inkylicious Ink Dusters with a combination of Denim & Lettuce Adirondacks then random stamping using Papertrey Ink game-themed stamps. I’m entering this into the “G is for . . ” challenge. 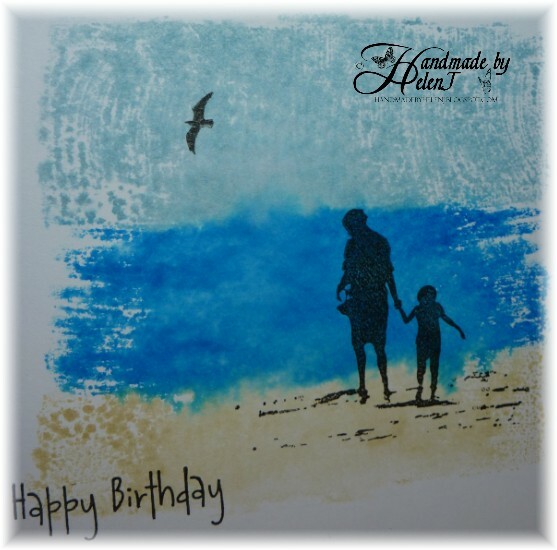 Another card for my sister’s birthday last week & which I decided was just right for entering into challenge 19 at Addicted to CAS, where the code word this time is Summer. This was my first try at brayering ink onto an acrylic block then stamping with it. I masked off part of the block to make an “ink pad” about 10cm square then inked my cardstock with it. (I later discovered I didn’t need to use the brayer at all, just swiping the ink pad across the acrylic block worked just as well.) Once it was fully dry I stamped the images & greeting with Versafine then decided to resist the temptation to add any further embellishment. I’m pleased to say my sister loved it!